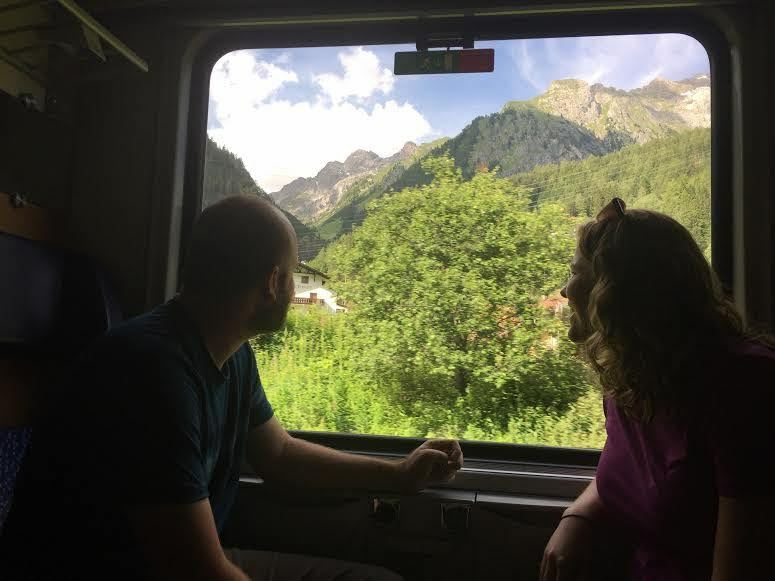 John Milito's Amazing Adventures: Austria, Liechtenstein, and Switzerland, Oh My! We awoke to our awesome view of Innsbruck, Austria but needed to get cracking, as time was short. We were about to hit three countries. We made a beeline for old town and headed toward the Golden Roof. The Gasthof Weisses Kreuz is real old. Mozart stayed here. The Goldenes Dachl (Golden Roof) is a landmark structure located in the Old Town (Altstadt) section of Innsbruck, Austria. It is considered the city's most famous symbol. Completed in 1500, the roof was decorated with 2,738 fire-gilded copper tiles for Emperor Maximilian I to mark his wedding to Bianca Maria Sforza. The Emperor and his wife used the balcony to observe festivals, tournaments, and other events that took place in the square below. The coolest place we've seen for a while on this trip was the memorial of Maximilian I, Holy Roman Emperor at the Hofkirche. Maximilian was a pretty big deal in Austrian and world history. One thing that I thought was interesting was the sort of modern merger and acquisition way that royalty worked at the time. It's a bit over my head so... save me Wikipedia! Through marriage of his son Philip the Handsome to eventual queen Joanna of Castile in 1498, Maximilian helped to establish the Habsburg dynasty in Spain which allowed his grandson Charles to hold the thrones of both León-Castile and Aragon. Since his father Philip died in 1506, Charles succeeded Maximilian as Holy Roman Emperor in 1519, and thus ruled both the Holy Roman Empire and the Spanish Empire simultaneously. The story they told was that although Maximilian had this giant ornate sarcophagus thing made and all of these statues that he was so behind on his bills that his creditors wouldn't allow his body to be placed here, so it's someplace else. The statues are of relatives and heroes. One thing that was kind of funny about the statues is that you could tell the sculptors usually do men because the women's hands and feet were giant and masculine. I would not arm wrestle any of these ladies. There was a delightfully retro coin operated audio guide thing present. I wished and I wished but not a single one of them came to life. The church does contain the tomb of Andreas Hofer, local hero of the Tyrolean Rebellion. We had finished with the statues and were making our way out when I remembered this door on the far side of a room that we hadn't checked yet. I was so impressed with the place that I didn't want to miss anything so we went back in. It was perhaps my finest moment of the trip. The thing we almost missed, and which our borrowed Rick Steves guidebook failed to even mention, was this ridiculously awesome Disney-esque presentation on the life and accomplishments of Maximilian I. There were multiple rooms of magic. This one had like a giant globe in it with different fun surprises. I think these are supposed to be all of the statues in the memorial, pre-unveiling. The whole thing was awesome. If Egypt had production values like this instead of boring dusty signs in their museums I would demand to go back. We had a little lunch at a cafe near the Golden Roof. I ordered a side of my childhood favorite spaetzle off the menu. Everyone was impressed. I was tempted to buy these lederhosen swim trunks I saw for sale in a tourist shop. Of course we had to check out a bakery and get something for the next leg of our trip. The Innsbruck Triumphpforte. I'm probably going to butcher this but one side of the arch is happy because of an important wedding and the other is sad because someone important died at that wedding. Then it was time for Liechtenstein. Trains don't go directly there from Innsbruck so we had to do a train/bus combo. We enjoyed our apple streusel while waiting for the train. Apparently "streusel" refers to the crumbly topping, and so you can have a streusel cake or a streusel muffin. This was sort of a streusel cinnamon roll type deal. The train came and upon boarding we saw that pretty much every seat was taken. We walked through a couple of packed train cars but then resigned ourselves to standing. I overheard a couple of Japanese people talking about seats and I chatted them up a bit. They said they'd found some empty seats toward the front of the train so we followed them. I had hoped that my years of studying Japanese would bear more substantial fruit than a free seat on a train to Liechtenstein but at this point I'll take what I can get. We walked past this woman sitting alone in a little section full of bags and asked her if the seats were free. She said something like "no, but if you can't find another seat you can have them". Um.. thanks? We walked through another train car and found nothing so came back to her and snatched those seats. Apparently she was holding them for friends that didn't look like they were going to make it. I bet. I didn't catch her name but she was an Austrian living in France. The ride was a decent length so I did my best to get a conversation going and I'd say it worked out quite nicely. I asked her the difference between Germany and Austria but her answer was a bit juvenile. She said Austrian German sounded better and that their food was better and the weather was better. Pretty hard hitting stuff there. I asked if she'd been to the US and she said no and that she wasn't planning on visiting because she didn't agree with our politics. I was a little bit wounded by that answer but also amused. That's something we would say about a trip to Iran or North Korea or something. She also said she heard that our news is censored so we don't know what's really happening in the world. Again, a strange criticism that I would also direct at a dictatorship or China. I mean, I would say that people are often uninformed but that's usually due to their own laziness than some conspiracy. Oh well. She was nice enough to offer to let us sit next to the window and even took a couple pictures for us. Finally we made it to Vaduz, capital of Liechtenstein, land of... banking and tax havens? Liechtenstein has the highest gross domestic product per person in the world when adjusted by purchasing power parity. It is also the 2nd richest (by measure of GDP per capita) country in the world, after Qatar, and has one of the lowest unemployment rates at 1.5%. I honestly expected it to be more touristy. There were a few shops but not too much going on otherwise. Vaduz Castle overlooked the city but I believe it still serves as the royal residence and so is not open to visitors. They had a big fat Botero sculpture on display. I'm not one to brag but I've perused the Museo Botero in Bogotá, Colombia. No big deal. Number 2 of probably 4 fire hydrants in the country. The castle is that way. "No Visit". Seems like a challenge when they specifically show you how to get there but then forbid you to visit. They did have a squished coin machine, but in overpriced Liechtenstein fashion it cost two euro instead of one. Boom! "Fürstentum" means principality. This was like a church blended with an amusement park. We found a restaurant that looked really good and had its own vineyard. Turns out entrees at this place cost $50-70. Not gonna happen. We ate someplace else that was nice too but not so ridiculously priced. Then it was time to say farewell or whatever it is they say in Liechtenstein. The Ramada Hotel Zürich City in Switzerland has a puzzlingly small ping pong table.